Despite last week’s unanimous vote by the State University of New York (SUNY) Downstate to shut down Long Island College Hospital (LICH) and liquidate their assets to pay down a significant portion of their own debt, hospital workers remain resilient and determined. SUNY doesn’t have the power to close the hospital; only the Department of Health (DOH) has the authority to close a public medical facility. LICH’s existence lies squarely on the state’s shoulders. Until then, hospital employees maintain they will continue operating the hospital as usual. “LICH IS OPEN FOR CARE,” they proclaim at rallies, forums and candlelit vigils – even in the offices of DOH. In 2012, LICH served more than 100,000 patients, admitted over 58,000 people to through the emergency room and delivered 2,000 babies. Sixty-six of their physicians in thirty-five specialties were ranked among the best in the nation. Services in pulmonary (lung), nephrology (liver), neurology (nervous system), and neurosurgery (brain surgery) are ranked among the top in the nation. LICH provides emergency, primary and mental health care for a wide-ranging number of citizens from all socio-economic levels. They are also a designated stroke, cardiac angioplasty and neurological and neurosurgical center. LICH began in 1858 as a medical school and a hospital. LICH started having relatively small annual deficits around the mid 1990’s. The Board of LICH opted to take on an outside partner to maximize their cost efficiency, according to Toomas M. Sorra, MD and President of Concerned Physicians of LICH. They eventually merged with Continuum Health Partners in 1998. LICH had never faced closure before being “plundered by Continuum,” she said. But in 2008, Continuum sold off approximately $50 million worth of properties for real estate development. After a decade of mismanagement from 1998-2008, Continuum sent warning notices to the employees of LICH, planning to discontinue women and children’s services as well as dental services. DOH refused to allow it because the services were vital to the surrounding communities. “Nothing has changed since then, except that the population of the community we serve has exploded. 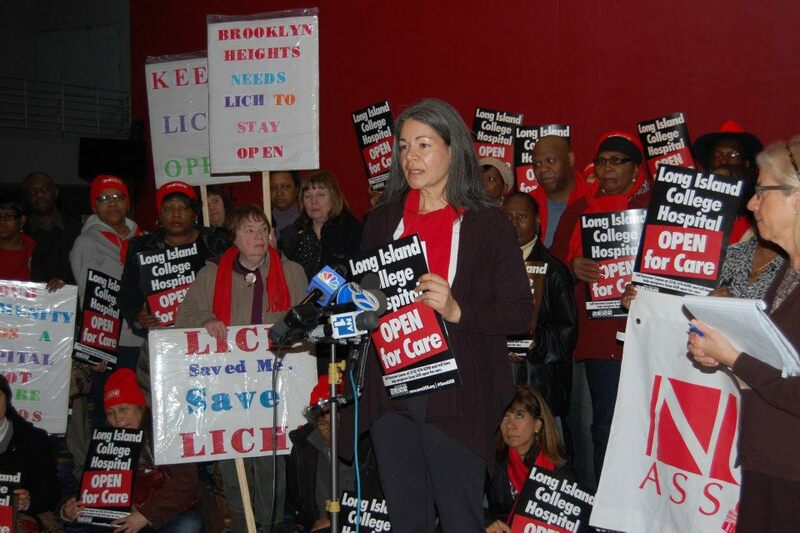 If LICH was too vital in 2008 to shut down even just a few services, it’s even more vital now,” wrote Semente. Continuum then filed formal complaints in 2008 with the State Health Department to terminate their partnership with LICH. Continuum was also aligned with St Vincent’s in Manhattan when their doors were permanently shuttered. St Vincent’s was over $1 billion in debt and they were forced to close in 2010. The state awarded SUNY Downstate a $40 million grant in October 2010 to acquire and operate LICH, making the hospital a secondary campus for SUNY. On May 29, 2011, SUNY purchased 18 separate LICH properties for$205,350,000. In June 2012, LaRosa, who had been president of the hospital for 13 years, unexpectedly resigned, right around the time that SUNY’s fiscal year ended and the Comptroller began their annual audit. LaRosa was replaced by Dr. John Williams who was formerly the president of Verras Health Care International, a hospital consulting firm. January 17 – SUNY Chancellor, Nancy L. Zimpher issued a press release regarding the audit. The meeting was announced on February 4, only 3 days prior. Those wishing to speak had to first register for a time slot as well as announce the subject of their comments by Wednesday February 6 at noon and were allotted 3 minutes each. February 8 – Jeff Strabone, former president of the Cobble Hill Association (CHA), proposed to change the zoning at LICH. February 18 – CHA met with Councilman Brad Lander to discuss zoning changes. February 20 – New York State Nurses Association, 1199 SEIU United Healthcare Workers East, Concerned Physicians of LICH, LLC and Kathleen Campbell Petitioners filed a lawsuit against SUNY and their trustees. February 28 – The Brooklyn Heights Association sent a letter to Governor Cuomo stating, “Let’s be clear, the Berger Work Group, appointed by Health Commissioner Shah, did not recommend closing LICH. On the contrary, when it issued its report on Brooklyn health care in 2011, it advised Downstate to consider consolidating all Downstate inpatient services at LICH. ” The university told the state comptroller that the deal was better than it looked on paper because Long Island College Hospital’s prime Cobble Hill land could be worth as much as $500 million,” the article read. Phase 1 – Secure $150 million in Stability Funds from New York State. $150 million is needed to keep the operation going and support mission critical items, while we work to fix many of the underlying problems that contribute to these losses. a) Proceed with the restructuring of the operation of Downstate Medical Center. b) Cease inpatient operations at LICH. The operating losses are significant and assumptions for the acquisition, particularly related to patient volume, were significantly flawed. c) Pursue legislation which will increase the flexibility of the organization to support a more financially sustainable operation. March 14 – Brooklyn Supreme Court Judge Johnny Lee Baynes voided the February 8 vote because SUNY violated the Open Meetings Law. March 14 – The Brooklyn Paper reports that SUNY did discuss LICH as real estate. March 15 – State Assemblywoman Joan Millman, and State Senators Daniel Squadron and Velmanette Montgomery sent Cuomo a letter requesting the shutdown be halted until the Empire Development Corporation could conduct a study on the economic impact of the closing. The vote was held in Purchase, New York – nearly 40 miles away from the facility. LICH workers organized and bussed over 100 workers and community members to the hearing. In response to the accusation that the vote had been scheduled upstate to discourage supporters of LICH to attend, Board Chairman Carl McCall claimed the meeting had been scheduled months in advance. However, SUNY only knew five days prior to this second vote that they would have to reschedule the hearing and revote on the issue. March 20 – Caregivers held a candle light vigil and march through Brooklyn Heights after SUNY’s unanimous vote to close LICH, “to remind community that we are still here,” said Semente. March 21 – LICH employees receive WARN notices, or notices of termination, effective June 18, 2013 – exactly 90 days after the vote, the time limit mandated by the state before a proposed closure. The letters were postmarked on Wednesday, March 19, suggesting that they were already prepared to mail out the day of SUNY’s second vote to terminate LICH. March 21 – Caregivers met with senior community group in Gowanus and Red Hook to raise awareness. March 23 – Caregivers will participate at 12 pm meeting at Borough Hall that Marty Markowitz has called to address the issue. March 23 – Caregivers will attend the Civic Association meeting to raise awareness in the Red Hook community at PS 15 at 7 pm. March 28 – caregivers will hold a forum for the Red Hook community at 6:30 pm at PS 15. For now, LICH as they say is still “open for care.” Hospital workers and community members are fighting side by side on a daily basis to keep it that way. Ironically, the very lives that LICH has saved time and again may be the same ones that save the existence of the hospital. excellent reporting by the red hook star. thank you!